Located in Santa Cruz, 25 km east-northeast from the capital, Funchal, Cristiano Ronaldo Madeira International Airport (FNC) opened in 1964, with a runway of only 1,600 m.
Once considered one of the most challenging airports in the world, where only the most experienced pilots could land, due to the size of the ‘mini’ runway, nowadays it offers passengers a relaxed experience while the pilot makes the final landing manoeuvres, since on the 15th of September 2000 Madeira Island inaugurated one of the biggest constructions ever executed in the region, amounting to a total investment of about 520 million Euros. Madeira Airport, boasting a runway of 2781 m length, gave the island a new image. Airport capacity is 3.5 million passengers/year and all types of passenger aircrafts are able to land and take off from this airport. The extension of the runway by one kilometre was one of the most ambitious constructions on the island, especially if one considers that the 180 pillars of the runway measure in total 120 metres (60 m above and 60 m under sea level). The old runway was turned three degrees to the north to assume its final position. Madeira Airport offers you several useful services, including information desks, travel agencies, rent-a-car desks, ATM machines, currency exchange, free Wi-Fi, public telephones, cafes, restaurants, shops (clothing, accessories, newspapers, books, perfumes, wine, etc.). There are two lounges and a Fast Track service, a priority channel to waste less time in queues. Passengers with special needs may benefit from an assistance service, ‘My Way’, provided by specialised professionals. This service should be requested up to 48 hours before the departure time of your flight. Toilets and lifts inside the terminal are adapted to people with reduced mobility. There is a 24 hour-baggage storage service (deposit) on the ground floor, ideal for bulky items, or you can also leave your things at the airport lockers (before security) and know they are safe. If your luggage gets damaged or lost, you should go to the 'Lost and Found' area on level 0. Although there are no hotels at this airport, you may find several accommodation options nearby, as well as a wider choice in Funchal city centre, only 25 km away — check out our list here for the best hotels, apartments and ‘Quintas’. Please note that, in many cases, the hotel may provide transport to and from the airport upon request. The 5 parks at Madeira Airport are open 24 hours a day, all year round, offering you from low-cost to premium parking options, either covered or outdoor. You have just arrived on Madeira Island and now what? The company responsible for bus transportation from the airport is SAM. After you leave the arrivals hall, follow the main road and keep on the right-hand side. Only a few meters away, you will find a bus stop. The lines that stop here are 20, 23, 53, 113 and 208, depending on the time of the day. The ticket is payable on board and it costs up to 4 Euros, depending on your destination. The Aero-bus is a frequent express bus service between the airport and Funchal city. Prices: €5 per adult (round trip: €8) and €2.50 for children. Prices subject to change. There are plenty of friendly taxi drivers at your disposal who will be glad to take you anywhere you want. The airport taxi rank is located outside the arrival lounge, just look for the yellow cars with blue stripes and a 'TAXI' sign on top. The trip between the airport and Funchal is around 30 to 40 Euros depending on the time of day. 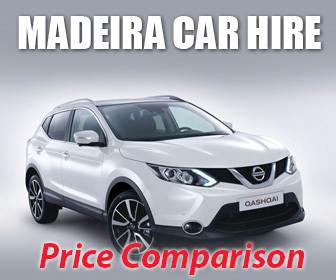 Discount Rent A Car offers competitive rates for car hire in Madeira. Our price-search engine finds the best daily deals for all vehicles, from compact cars to mini-vans. Third party insurance and breakdown assistance are also included in the price. Just book online before you go and pick up your vehicle at Madeira Airport.